Too often, traffic lights can be the bane of a driver’s existence. Trying to get somewhere, doing your best to beat the yellow, only to be foiled by that oppressive glare of red. There’s a reason that so many people consider hitting a steady stream of green is considered a sign of good fortune. We’ve all been there. Seriously, whoever among us hasn’t been annoyed by traffic lights can cast the first stone — and aim it right at a traffic light. Lo and behold, there is hope at the end of the boulevard! If you’ve ever dreamed of the day that a car could predict the pattern of a traffic light, then you may soon have a pleasant reality to wake up to. Thanks to the innovate efforts of Audi, the company is currently trying out a traffic-light reading system via a test car rambling through the sun-baked streets of Sin City. Dearest fellow traffic-light warriors, welcome to Project Traffic Light Online. 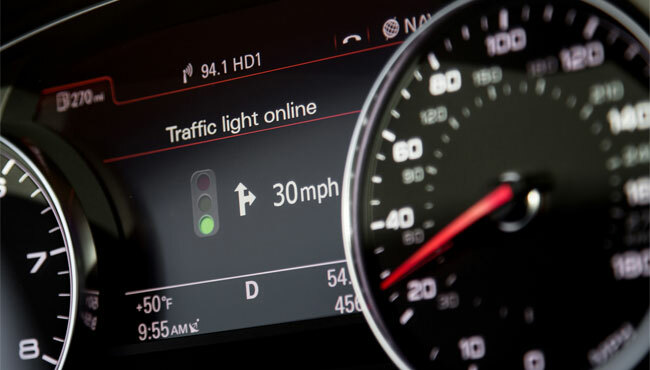 With the permission of the Regional Transportation Committee of Southern Nevada, Audi’s connect Online technology is able to tap into Las Vegas’ main traffic computer and let the driver know when a traffic light is about to change. The system also provides feedback about whether or not a driver should try to beat a green light or stay put and wait out the red light. Wait, there’s more. Much, much more. This nifty little device does more than keep you out of the crosshairs of Las Vegas’ finest. It has some other neat perks, too. So, what else can Project Traffic Light Online do? For that miserly bunch of us that love to save money on gas, this technology is like the best birthday gift ever. A car that can predict traffic light changes and then report that information back to you means driving will become a more streamlined endeavor. It helps prevent gunning the gas to blow through a green light on time, only to come to a screeching halt when it turns red at the last second. That type of driving drains gas, which subsequently drains your budget. By knowing when a light will change, you can temper your driving speed toward how the light will change. On top of that, the feedback system will also recommend a driving speed that promotes your chances of hitting green lights. Another major advantage of this new technology is a lot less selfish and benefits the community at-large. The more people that have access to changing traffic light patterns, the less chaotic traffic can be. If you think about it, advanced knowledge of when a light will change gives everyone a chance to drive at a similar rate of speed. The annoying reality of stop-and-go traffic morphs into an easier flow. The means traffic can go a lot smoother for all motorists. Just imagine driving without all of that aggression and frustration. So, what about drivers without Project Traffic Light Online? Is it pointless to anticipate the goodies that come along with the system if only a select few have access to the technology? Nope. Not at all. It only takes a few cars among many to help improve traffic. According to research, only 5 to 10 percent of cars with this technology is needed to optimize traffic conditions and stimulate more efficient driving conditions. All in all, Project Traffic Light Online is an essential win-win deal. Greater access and knowledge of traffic light systems equals better drivers and easier traffic. Now, who in the world wouldn’t want any of that? If you can’t see the good in that, just pick up that handy little stone. You’ll know right where to throw it.